How to Cook a Precooked Burger? Beef burgers that have already been cooked can provide an easy, simple and quick meal. Reheating burgers again can be tricky; it's important to bring the internal temperature up to 165 F, measured with a meat thermometer for safety; however, over-heating them can result in a dried out, unappetizing burger. Be mindful when warming and you can enjoy a scrumptious burger all over again. Reheat the burger on the stove in a pan. Heat a tablespoon of olive oil in a skillet. Place the precooked burger into the warmed skillet. Heat the burger for 90 seconds to 2 minutes on the first side, flip it over and continue to cook it for another 60 to 90 seconds. Check the temperature with a meat thermometer and if the burger has reached 165 F then it is ready to eat. If not, continue to cook for another minute or two, and then recheck the temperature. Reheat the burger in the oven. Preheat your oven to 400 F. Place the precooked burger on a baking tray or in a baking dish, uncovered. Warm the burger for 5 minutes and then check the temperature with a meat thermometer. If the burger has not reached 165 F yet, place it back in the oven to continue cooking. Check the temperature every 60 seconds or so, to avoid overcooking. Warm the precooked burger in the microwave. Place the burger on a microwavable safe dish and cover with a paper towel. Heat the burger for 90 seconds and then check the temperature with a meat thermometer. If the internal temperature has reached 165 F then the burger is ready to eat. If not, continue to cook in 30 to 45 second increments until it has reached the proper temperature. Defrost frozen precooked burgers in the refrigerator overnight before warming or cooking again. 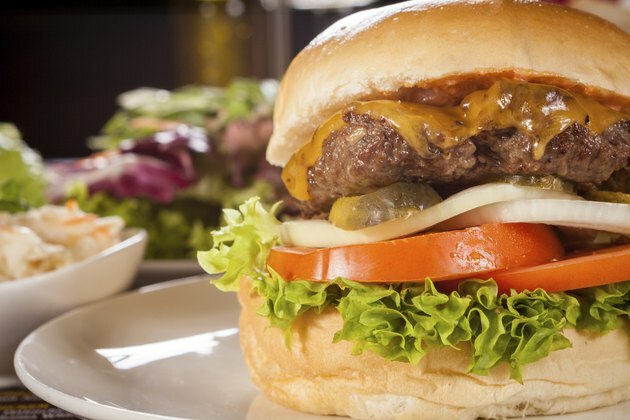 Add condiments to the burger, such as barbecue sauce, steak sauce, mustard and ketchup if the burger becomes to dried out for your taste. Condiments can add flavor and moisture to meat. Sprinkle additional seasonings on the burger if you desire, such as salt and pepper, but remember that the burger will still contain the original spices and flavor.